Rajiv Malhotra: Swamiji, There is a lot of a confusion because of language translations that people make. People translate that heaven is same as Svarga and Punya Paap is same as sin. Can you explain differences between Svarga and heaven because – and there is no devil in our system. There is no anti-Brahman. There’s no anti-Shiva, like there is anti-Christ. And the whole idea of Christianity is that you should be helping Jesus fight the devil or something. We do not have that opponent. There is no duality here. Swami Nithyananda: See, first thing, the whole translation done by Western scholars is with the purpose of either –the profound Vedic and Hindu thought currents are lower than their thought currents or equivalent. They are not interested in the deeper and larger and broader dimensions explained, expressed in Vedic, Āgamic literature and thought currents. For example, Sadashiva cannot be translated as God. God is only generator, operator, destroyer, but Sadashiva does five. Generation, operation, managing, delusion and liberation. When we do not know delusion and liberation, we do not know the life. Unfortunately, westerners could see only three operation in the life – Generation, operation, destruction. They never were able to perceive, conceive anything more than these three. So, they framed, created their God – generator, operator, destroyer. I should say, God is the projection of man’s mind. Sadashiva projects us from his mind. Swami Nithyananda: Sadashiva is much broader, deeper, higher understanding than God. Even for practical purpose, Sadashiva should not be translated as God. Because of this mistake, two major dimensions delusion-management and liberation are removed: as a result we do not completely understand the God concept. Rajiv Malhotra: And our process depends on that. Swami Nithyananda: Our process depends on our understanding. And in every level, whether it is a God or even the Svarga – Svarga means whatever you want, you wanted, that Sva, becomes reality, arga. What you wanted becomes reality and you celebrate. It is not common for all. We need to know each jīva’s Svarga is different. Rajiv Malhotra: It’s a private reality. Swami Nithyananda: It’s private reality. It’s like your home. All homes in that frequency are in one plane. Like a Trishanku can visit Varuna. Varuna can visit Agni. Agni can visit Vayu. But they are all having independent svargas. Rajiv Malhotra: This is a very profound concept. Swami Nithyananda: Svarga, a basic understanding is different from the heaven. Heaven is a multiple apartment complex. See, in heaven, all common utility is common. Rajiv Malhotra: I, in fact, went to the –one of the Mormon headquarters and they were giving me – trying to convert me and I made it look like I’m really interested in understanding what’s going on. So, they gave me a tour of what is this heaven, almost like a retirement community. So I was asking questions, do we play golf. And they said, yeah, yeah, you will have golf. And how many apartments– how big apartment, they were making it really like this –some kind of a place where you go and retire. And so, they have this idea, very silly kind of, a very basic kind of an idea. And svarga is such a –more complex and more sophisticated. Swami Nithyananda: Svarga is completely different concept. 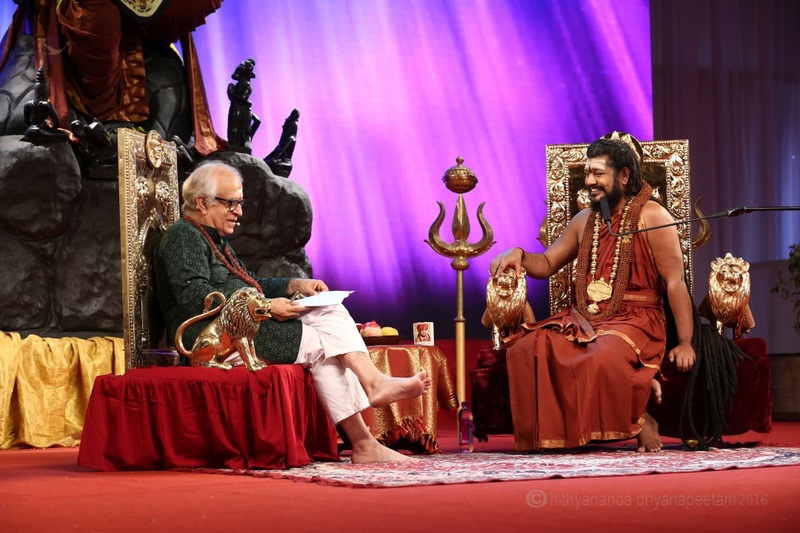 Swami Nithyananda: And in every level, we should be very clear, only our practitioners should translate. Swami Nithyananda: We should not swallow the translations, word equivalence forced on us by the limited understanding non-practitioners of Hinduism. They may have two reasons. One – ignorance, second – cunning, purposeful waging war through this intellectual distortion. Whatever maybe their purpose, we should not allow – especially Hindu gurus should not go behind Max Müllerians. Swami Nithyananda: And these Western non-practitioner translations being accepted by Hindu organization is the biggest damage done to Hinduism. This – the whole neo-Vedanta sampradaya, neo-Vedantians are the product of non-practitioners’ translation of Hindu texts. Rajiv Malhotra: Which have been accepted by our own people.